Brief Description: Broadleaf weed with three leaf pattern and various small flowers – usually purple, though not always. 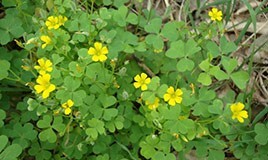 Oxalis is a broadleaf weed that was likely spread on purpose thousands of years ago, because it is edible and believed to have healing properties. Oxalis is a flowering plant that has leaves that look similar to large clovers (three leaf pattern), except the leaves turn inward like the fins of a dolphin. Oxalis actually refers to a variety of different plants, all of which have roughly the same type of growth pattern, but may have different colored flowers. Pink, white, and purple are very common colors. Oxalis develops an extensive root network which is one of the issues that prevents removal. As a broadleaf weed it likes moisture and it prefers to take advantage of week soil. As with many other broadleaf weeds, Oxalis will not invade a lawn that is thick with grass, as the turf chokes out the unwanted invader. You should try to avoid overwatering, but unfortunately the humidity can still create an environment that is ripe for Oxalis growth. If you find only one Oxalis plant you can try removing it by hand early and see if that is enough. But because of the root network, it’s likely that Oxalis will come back and possibly grow over other areas of soil. Contact Green Lawn Fertilizing today to find out about our broadleaf weed control services, and rid yourself of Oxalis and other broadleaf weeds today.